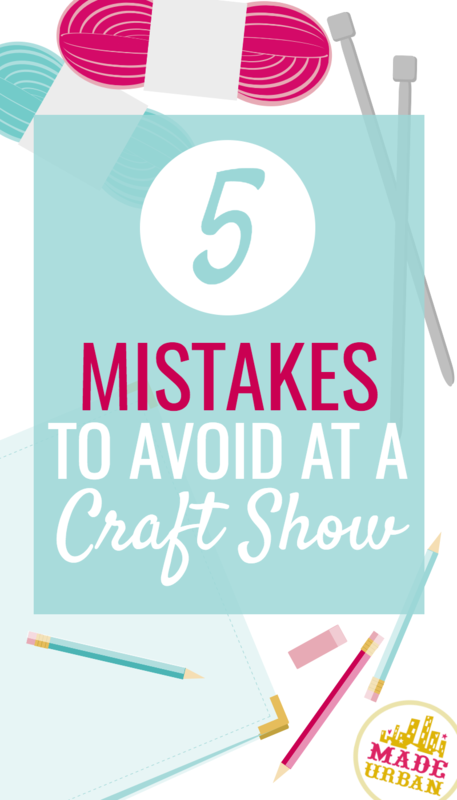 Whether you’re getting ready for a large trade show and have an entire booth to fill or you’ve booked a table at a community craft show, these 5 mistakes are always important to avoid. Although you don’t want an empty booth and you want to give your customers options, you don’t want to overwhelm them. Try to focus on your niche and offer a few options within a product line. As creative types we can brainstorm a million different items and styles to create but it’s best to narrow it down to your key pieces. You’re not a department store so although you could offer a wide variety of handmade products, consider what you want your target market to remember you for. When you offer too much selection, you sort of become a jack of all trades, master of none. Too may products screams lack of identity. The best brands know who they are and what they’re offering. They’re not trying to please everyone; they’re going after a targeted demographic and offering a specific selection that appeals to them. Although you may be able to make dishcloths, scarves, paintings and purses, having them all on your table waters down your message. I’ve been to a LOT of craft shows and some of the more popular booths only sell one product. That’s not to say offering several products is a bad idea…not at all. Booths with several different products for sale can be just as popular. But even when there’s a wider selection, there should still be just one key message. Basically, you want your products to tell people what you’re the best at and what they should come to you for. What makes your products better or different than your competitors? What do you do exceptionally well? Is it making bold statement pieces? knitting chunky scarves? Or maybe you source the best ingredients for your soaps. If you sell a wide variety of jewelry but every piece is colourful, bold and oversized, you still have one message: you make statement jewelry. If you offer scarves, mittens and hats in a wide variety of colors, materials, weights and patterns; what’s your message? There are many people who can knit those items so how do you convince shoppers to buy from you? Maybe you use the best quality of yarn, offer your knitted products in this season’s most trendy colors or perhaps all scarves, mittens and hats follow the same fair isle pattern. The reason your products are different or “better” needs to be obvious and the more items and selection you add, the harder it is to convey that message. If you need a little help and direction when it comes to refining your product selection, join my FREE 5-DAY CHALLENGE. The challenge comes with an instant FREE download: MAKING PRODUCTS THAT PROFIT, which is a chapter from my ebook MAKE MORE MONEY AT CRAFT FAIRS. You don’t want to throw caution to the wind and randomly decide what to bring to your next event. You want to make calculated decisions that you can be confident are going to bring you more sales. Although you may be narrowing your selection down, you do want to offer a range of price points. Every business is different and if you only make one product, you may only have one price point, which may work perfectly for you. But the higher that price point goes, the more you want to consider offering an entry level product. Think of it this way; when you first meet someone, are you immediately ready to give them your number and start setting a date, time and location to meet up again? If the meeting went really well, maybe. But if you didn’t spend enough time with them and want to get to know them better, you’d be more likely to take their number or make casual, non-committal plans to meet up. Think of your relationship with shoppers the same way. You can’t expect all of them to fall in love at first sight and dive right in, purchasing your most expensive item. Most shoppers want to ease into a relationship with your business. Grab a card (try this trick to keep your business cards out of the trash and reduce printing costs) so they can check out your website and get to know you better or buy something small that won’t require risk (what if they decide they don’t like it or it breaks? At this point, they don’t know what kind of customer service or quality you provide). Try to stock up on low and mid-priced products so those who are being introduced to your business for the first time, have a selection to buy from. Use your high-priced items as the showstoppers. Place them at eye-level and in a spot that catches the eye to draw people in. If all your products are around the same price point or you’re unsure if you’re providing enough pricing options, join the free challenge and head to page 18 in the free download MAKING PRODUCTS THAT PROFIT for direction. You don’t have to reinvent the wheel or spend a lot of time and money creating new products. Just a few small changes and you can instantly boost your sales. We’ve just talked about the people who do buy from you. They’re either a little skeptical and want to ease in, like your work and are comfortable spending a little more or are in love and aren’t worried about the price. But what about those who don’t buy? On average, only 2% of shoppers will purchase from you. That number can go up or down based on several factors. If you sell a niche product with very little competition, are selling at an event targeting your exact market, the event is bi-annual and attracts more buyers than people looking to browse, it’s around a gift-giving holiday, etc. you may sell to more than 2%. If you’re selling products under a saturated category and your display doesn’t attract shoppers, you may sell to less than 2%. That leaves 98% of the people who walk through those doors, not putting money in your hands…..today. If you think about that number and find ways to encourage a second contact with them, you can keep sales rolling in long after the event is over. A stack of business cards on the outer edge of your table is a must! People tend to put more thought into handmade purchases and are less impulsive with them. If your booth is too busy to look through each item or they want to think about it a bit longer, make it easy for them to purchase from you after the craft show is over. Even if they do purchase from you that day, stick a card in their bag so they can easily buy from you again. Try collecting email addresses by asking people if they want to sign up for your newsletter. There are several factors to think about and you don’t want to break any laws so be sure to have a read over this article in regards to newsletters and you may also want to check out 3 BIG LEGAL MISTAKES CRAFTERS MAKE. This point also goes back to your message. Shoppers have a lot to take in at a craft show and although your booth does need signage, they still may not remember your name or logo. So they’ll rely on other descriptive features. If you don’t have a message, they’ll be left with: “the one selling _________ soap/jewelry/scarves”. How will they find you online? How will they describe you to the event planner? When you build your business around a message, you make it so much easier for people to remember you, find you and purchase from you. Imagine, instead of selling soap in a variety of floral, fruit and herb scents, you sold candy scented soaps. You could have so much fun coming up with a tagline, naming your products, designing your website and turning your display into a candy factory. Who’s going to forget that? And how easy would it be for them to find you when they Google “candy scented soap” + your city. Get the worksheets and directions to uncover your message if you’re not quite sure what it is or should be. Craft shows can be intimidating, especially if sales aren’t your area of expertise. But people attend craft shows because they want to meet the maker and hear the story behind their work. If you’re sitting down with your head in a book or are busy chatting with your helper, you’re going to miss good opportunities to gain a new customer. You don’t have to be someone you’re not; just smile and start a conversation. It doesn’t even have to be about your work; ask them how their day is going or if they’ve bought anything cool yet. Once you break the ice it’s easy to steer the convo towards your pieces and answer any questions they have. Think about it this way: people visit craft fairs for the unique shopping experience. They want to find one-of-a-kind items made by talented artists. If you don’t share the story behind your business and your products, you’re taking away an important part of their experience. If you bought an amazing pair of earrings at a craft fair, what would you rather respond with when someone at a dinner party compliments them? Thanks! I bought them at a craft fair. Thanks! I bought them from this amazing local business called __________. The owner gathers crystals from vintage chandeliers removed from old homes, restaurants and hotels around the city. They take each chandelier apart and then re-string the crystals into these amazing earrings. They each come with a card sharing which building the chandelier came from. These ones are from the hotel downtown built in 1915. Way better story to tell right? It gives the customer something interesting to talk about each time they wear, use or point out your products. It also builds your brand awareness when people talk about your products. You don’t have to be saving the world or reinventing the wheel to have something interesting to share with shoppers. There are a variety of ways to uncover the hidden stories behind your business and products. In MAKE MORE MONEY AT CRAFT FAIRS, all of Chapter 9 covers the art of selling. From breaking the ice and finding ways to be comfortable to drafting your perfect sales pitch…without making shoppers feel like they’re being sold to. Speaking of your display doing the selling, you want to make sure you turn that display into a selling machine rather than a meek salesperson who’s not sure what to say, doesn’t understand your brand and has shown up in wrinkled clothes and unbrushed hair. building enough stock to get you through the weekend. But your booth setup deserves just as much thought and effort as your products. I won’t get into too much detail when it comes to how to create an amazing display; that’s what this is aaaaall about. But I will tell you why your display is mucho, mucho importante. First, if your booth doesn’t catch shoppers’ attention and draw them over, you won’t have much need for all that product. When your ideal customer walks in the door, you want them to notice you right away based on the color of your space and products, the font in your signage, your display fixtures and props and the image you give off. Secondly, if you get shoppers to come closer and your display is a full-on Monet; from far away, it’s OK, but up close, it’s a big old mess (Clueless quote for ya there), you’re de-valuing your products. Imagine being served a filet mignon on a plastic plate in a dirty, noisy, run-down restaurant. The meat may be worth $20 but you’re not willing to pay more than $5 based on the surroundings. Serve that same steak in a beautiful restaurant with an elegant atmosphere and helpful servers and you’re now willing to pay $50 for it. Make sure each element surrounding your products in your craft show booth, add to their value, not detract from it. From your tablecloth to your tiny price tags, no detail is too small to put effort into. And lastly, if the space isn’t designed properly, you’ll have a hard time keeping shoppers around long enough to buy. You don’t want shoppers to feel cramped, like they can’t get to things or might knock something over and you don’t want your showstopper, which is supposed to be drawing more people over, to be blocked by people paying for their purchase. Okay, a little bonus one for you I learned in retail. As soon as there were more than 2 people in line to pay, an associate had to jump on the till and get that line moving faster. The longer the line up, the more reason people had not to buy and the quicker you move that line, the more sales you can make in an hour. Even if you never have a line up of people wanting to pay, your customers don’t want to stand around waiting for you to find your credit card machine, searching for change or rummage through boxes to find your tissue paper. No one likes to wait and being unorganized doesn’t give off a professional vibe. The longer you spend completing a transaction and wrapping up the purchase, the less time you have for other customers. Keep everything you need for making a sale in one area and if possible, prep bags beforehand by pre-stuffing them with tissue paper and business cards. This also applies to the front of your table too; make sure products are clearly labelled, easily accessible and shop-able. As soon as you book a show, start going into prep mode. Figure out how much stock you need (in Ch 6), how you’re going to transport it, display it and package it. Do a mock set up at home and take photos so it’s easy to get your booth ready the day of and guide any helpers. Run through how you’re going to wrap your items when you make a sale and how much time it takes you. As you work through your mock set up, make note of anything you’ll need so you don’t forget it at home. Mistakes happen but try to avoid the unprofessional moments of having to tell a customer you forgot your credit card reader or business cards at home (don’t forget this fun trick if you run out of business cards, forget them or don’t have time to get more printed before an event…or you just want to save on printing costs). 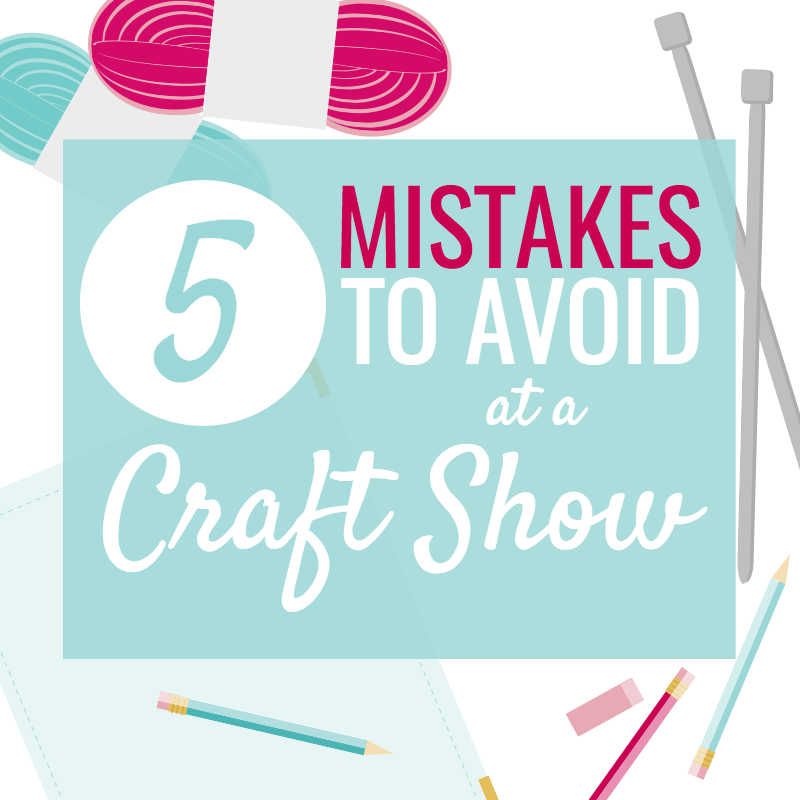 Which mistakes do you see vendors make most often at craft shows? Share in the comments! Boy, I wished that you could give this lesson to the Annual Festival we have here in our town. Vendors act as if they are part of the inventory and just sit there an never even say “hello”. I am so fed up I stopped attending. I stood at one booth with the product in my hand to purchase and the seller never open their mouth. I put the item back. My money comes with a price: Be nice to me and I will release it, act snobbish and it will never be yours! Ive just booked my first stall and its for a Christmas Market. these 5 pointers are so valuable…you have given me an amazing idea with number 4. So excited and nervous at the same time, this all helps. Thank you so much for this article. You will never know how much it has helped me get ready for a show. That’s so amazing to hear Joy! Thanks so much for reading and good luck at your next event! Thank you for the wonderful tips. I’m about to do my first Christmas fair and your tips are very helpful. I’m excited and nervous. Hi Bellatrix! Good luck at your upcoming event. I hope the tips help you have a great show! If you need a service provider for your data processing and customer services need and more. Thank you! I think it’s important to start branding your business. It’s not just about a logo. A brand creates an experience for your customers so they know what to expect from your business, why to choose you over another and to keep them thinking of you and purchasing in the future. Good branding may seem like a “nice to have” but it will help you sell more. Even if you don’t have a strong brand established yet, it’s important to let shoppers know where to find you after a craft fair. Most people don’t purchase on the first encounter so if they can’t find you when they think of your products a few days later or next month when they need a gift, you’re losing sales. A business card can still be used to hand out your email address, website or social media pages. I am about to venture into doing my first craft show, I found find your focal point very intriguing. Keep it simple was awesome, would have went to far to the elaborate side. This article was very inspiring thanks. Glad you enjoyed it Jewel! Trying to offer something for everyone who stops by your table is a very common mistake and so easy to do. Good article . . . however, I must disagree with #1. You CAN offer a lot of different type items if you set your booth up correctly. Have sections, each featuring like items. You may need more than one booth space to accomplish this. I normally get two spaces, and at a few shows . . three. I sell a LOT of different items . . . from Christmas ornaments to jewelry to Pebble Art to Halloween decor, to t-shirts (and a bunch of other stuff, in between). My booth is ALWAYS busy. I attribute that to the fact that I sell a wide variety of products, therefore attracting a wider variety of buyers than those that sell a single type of item. So, I don’t think having the capability to make and display a lot of types of crafts should be viewed as a “mistake”. If selling and displaying a wide variety of products works for you, then keep up the good work. I stand behind my advice for handmade businesses to narrow their selection. I started with a craft show table full of everything from pj’s and rice heating bags to aprons, mittens and purses. When I realized the majority of my sales were coming from a few select products, I focused on those, cut back my selection and saw my profits, sales, sales per transaction, repeat customers, productivity, etc. increase. It was the best thing I did for my business and cut out a lot of work creating product I only sold a couple of and had to mark down at the end of a season. I’m extremely nervous but excited about my first craft show. I think your article is just what I needed to help put me at ease so that I can focus on what I should do to have a successful show. Thank you so much. I signed up for the 5 day challenge so that I can prepare myself for the best show I can possibly do. Thank you for the great advice and information! Much appreciated! I am just about to do my 3rd market and I am still learning and trying new things! I have tried to be as unique and possible, selling products/items that have no or little competition with other vendors… Just have to find it and sample it to the customer…. engage your demographic targets..